adb logcat | FINDSTR “msg for filter"
... But first ensure your command line action is working as intended by checking it manually at the command prompt. We don't have a copy of the .apk file you're trying to install, nor do most of us currently have an Android device hooked up on which to test the apk package - so you'll have to check that first on your own. The command line action may need some restructuring (such as that which colc has indicated above). Test it manually at the command prompt to find out. The second issue is that at Line-10, you've instructed AMS to retrieve Paragraph info from your LastLog variable - but there is nowhere in your code indicating from where this variable is retrieving its data. CommandLine.Execute() pipes in an indexed table containing the following 3 values: StdOut, StdError & ExitCode. You've correctly instructed AMS to return the first indexed item back to the Paragraph object (ie. Result.StdOut) but have not coded in a source for the data from your LastLog variable. (And, keep in mind that the data from StdOut will get returned ONLY if your command string is correctly structured). Lastly, you say you require multi-threading? AMS is single-threaded only. So if you require multi-threading (for whatever reason), then you'll need to make use of either the MultiThread Object plugin (by LucasTheDuck) or LuaLanes (by Asko Kauppi). As stated, for multi-threading you'll require the aforementioned plugin or the lua lanes module. Or you can use an approach something akin to multi-threading with co-routines (although this is not real multi-threading). 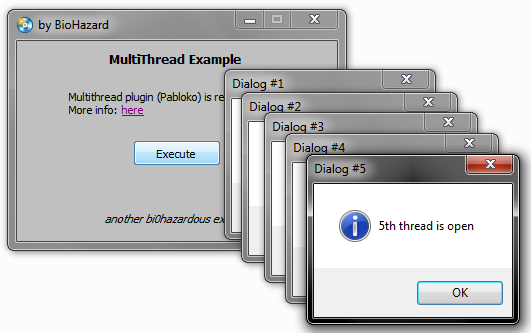 The attached example is a basic demonstration of how the MultiThread object plugin (Pabloko aka. LucasTheDuck) works. (Take note that it won't work with for loops). (Take note that it won't work with for loops). For loops don't work in the MultiThread plugin? If that's the case and the MultiThread plugin really uses threads, it's not supporting loops because lua_lock and lua_unlock are not implemented in IR's build of Lua 5.1. If those are implemented, the Lua state will synchronise between threads - but become a bit slower. Hmm, interesting. There's a link to the author's thread (external) on the demo attached above. Reference to the 'for loop' failure is made on the 3rd page of that thread and it seems the issue was never addressed. I think Ulrich also had some kind of Multthread plugin out at some stage (which might be a better option) - though I can't see it on his website anymore. Anyone know whatever became of that plugin?